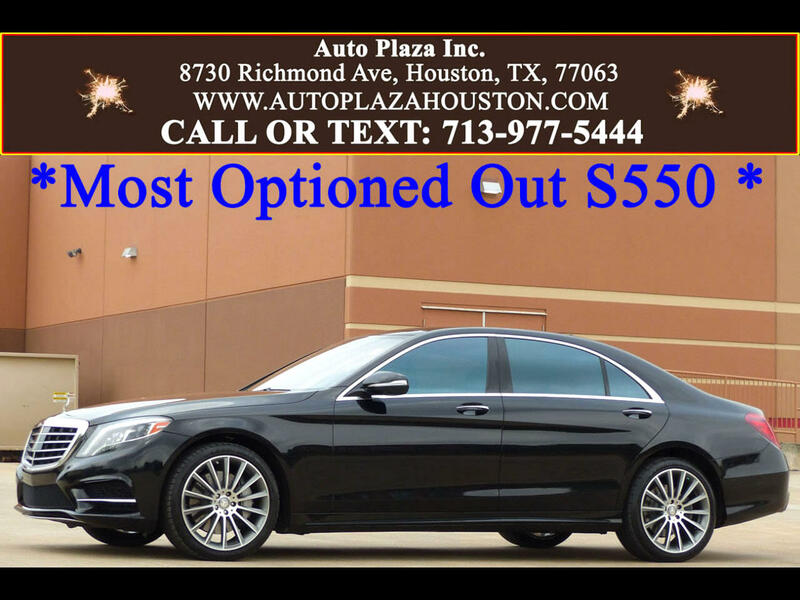 Used 2015 Mercedes-Benz S-Class S550 for Sale in HOUSTON TX 77063 Auto Plaza, Inc.
Auto Plaza Proudly Presents this FULLY LOADED 2015 Mercedes Benz S550 with the Premium , Driver Assistance, Warmth and Comfort, Rear Seat, Executive Rear Seat Plus and Sport Packages Making This One If Not the Most Loaded S550 Currently Online!!! This Vehicle Screams SUCCESS, with its Advanced German Engineering, Seductive Styling, and Advanced Technological Features. Extensive options include, Night Vision, Heads Up Display, Rear DVD Screens, Rear Refrigerator, Folding Rear Tables, Exclusive Leather Trim Upgrade, Distronic Plus, Split View Screen With Navigation, Panoramic Sunroof, Blind Spot Detection, Dynamic LED Headlights, Backup Camera, 360 Degree View Camera's, Active Park Assist, Front and Rear Parking Sensors, 20" Alloy Wheels, Hot Stone Massage, Power Cooled / Heated / Massage Leather Memory Seats, Heated Steering Wheel, Premium Burmester Audio, 6CD/ DVD Changer, 2 x USB Connections, SIRIUS Satellite Radio, 115V Power Outlet, Attention Assist, LED Daytime Running Lights, Power Side and Rear Sunshades, Turn Signal Mirrors, Tire Pressure Monitor System, Keyless Go, Steering Wheel Controls, Steering Column Memory, Power Locks, Power Windows, Power Steering, Rear Window Defroster, Cruise Control, and too Much More to List. The Advanced Mercedes-Benz Technology and Engineering Ensures that you Experience Exceptional Handling and Stability, Offering you a Ride that is Safe and Secure. SO CALL NOW!